We pulled together an easy-scan listing of the CREDC's list of proposed priority projects that included details -- it's above in large format, click or scroll all the way up. It's important to note that these projects -- and others listed in the the CREDC's report -- might not get funded. And if they do get funded by the state, they might not get funded at the requested level. And even if these some of these projects do get awarded funding, they still might not happen. And others that don't get funding might end up happening. Also: Albany County is looking for $200,000 (project cost $1 million) to create a second exit for the TU Center parking garage. Description clip: "Funding will enable Brown's Brewing Company to create a state-of-the-art, sustainable craft brewing and agricultural destination at its Hoosick Falls brewery. Brown's Brewing Company is a community-oriented, sustainable craft brewer with locations in both Hoosick Falls and Troy. This project will create 26 new jobs and renovate a 6,000-square-foot portion of the historic 19th-century Hoosick Falls facility into a full canning and packaging line, build out to increase cold storage capacity and expanded laboratory space. The funding also will enable Brown's to increase barrel production to 15,000 barrels from the current 5,000 annually, ensure quality control of its products with additional laboratory space, and widen production capabilities with a full canning and packaging line." A rendering for The Mill project. Description clip: "The funding will enable the creation of The Mill Artisan District, an innovative project that will create jobs in the local food, craft brew, and specialty brand sector within walking distance of the designated Schenectady Opportunity Zone neighborhoods. The district will revitalize a condensed, blighted area of downtown Schenectady and leverage public and private investments to transform three long-neglected streets into a unique downtown artisan hub including apartments, restaurant, and retail space." Downtown Albany Arts Entertainment District | Palace Performing Arts Center Inc. Description clip: "This project focuses on creating opportunities and improving outcomes for residents of Albany's most distressed communities: West Hill, Arbor Hill, and the South End. The Legal Aid Society of Northeastern New York, Inc. will acquire and renovate a building at 95 Central Ave., Albany, where it can offer critical legal services to its diverse clients in a respectful, professional and welcoming space." Description clip: "This project will revitalize a long dormant manufacturing building at 155 River Street, Troy, creating a significant mixed-use anchor property in Troy's Business District and enlivening commercial activity on an important underdeveloped block. Plans call for a mixed-use redevelopment with two restaurants, Class A office space, three residential apartments, a boutique hotel with an exercise room and open terrace, and a two-story parking garage with rooftop restaurant terrace." 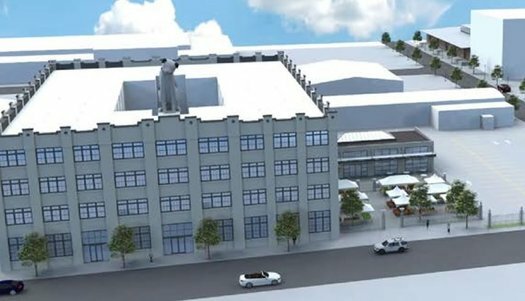 Since being awarded a capital grant through the CFA process in 2015, Good Market has secured a location for the project in the iconic Nipper Building on Broadway in north Albany and is now actively recruiting food merchants and will be instrumental in revitalizing the Warehouse District. Good Market will host approximately 20 food merchants who will collectively create approximately 80 new jobs. Its location on Broadway means Good Market will be readily accessible via public transportation, allowing people access to get to these newly created positions. Good Market will provide access to fresh healthy food in an area of the city that is effectively a "food desert." The excitement around Good Market's launch has also sparked a wave of new potential investment in the emerging neighborhood. I've heard from a lot of people that Troy could really use a downtown movie theater! As businesspeople like to say, that could provide some synergy that would assist local dining at the same time. That along with a market that sells decent produce every day and a gym and I could get rid of my car. 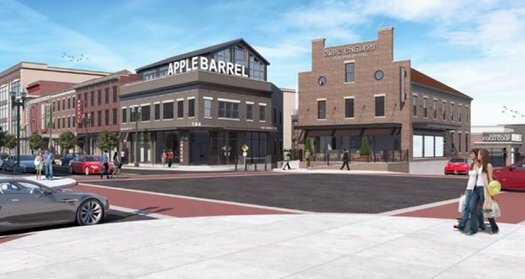 It took me a second to figure it out, but that rendering for 'The Mill Artisan District' is taken from the northwest corner of the State St. and S. Church St. intersection looking southeast.